​ What to do on a hot humid afternoon and you’re not up to the traffic situation in the metro. Watching TV may be the best way to pass the afternoon. But what show? Surfing the cable brings me to (SKY HD 167) the Kapamilya channel where a new show with the network’s best looking guys is currently running. It premiered on Oct. 15 and is now on its third week. 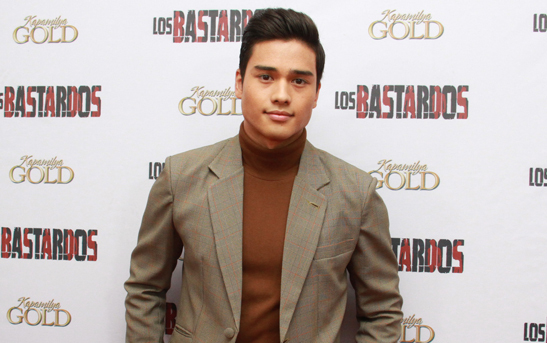 It seems the show has captivated the fans of Marco Gumabao, the good-looking son of actor Dennis Roldan and former runway and commercial model Loli Imperial, stars along with Jake Cuenca, Diego Loyzaga, Albie Casiño, and Joshua Colet as brothers who are at odds with each other to seize power in the family. That’s their destiny in Los Bastardos, from the latest book in the Precious Hearts Romances Presents series. The series based on the Cardinal Bastards series of Precious Hearts Romances tells the story of five brothers who must fight against each other for the right to the power and money of the Cardinal family, led by its patriarch, Don Roman Cardinal. Don Roman is leading a happy life with his small family but tragedy will strike that will urge him to look for true love from four other women. He will sire five sons from five different women. There is Isagani (Jake), Don Roman’s long-lost son with his first love; Joaquin (Diego), the only son who’ll grow up under his care; Matteo (Marco), who will grow up with the rival family of the Cardinals; Connor, who will become a conman bent on destroying the Cardinal wealth; and Lucas (Albie), whill will grow up not knowing the man he serves is his own father. Although they come from different worlds, they are bound together by the same blood. The series shows how their lives are intertwined, especially when they find out the truth about their identities. In the early days of the series, I saw Geoff Eigenmann as the young Roman Cardinal. I am not sure if he has moved back to the Kapamilya lot, or was the scenes of the series with him shot before he did the Kapuso afternoon series Contessa with Glaiza de Castro. But, if he had decided to be a Kapamilya again, well and good for him, as he had been waiting to be given the right break to jumpstart his snoozing career. Los Bastardos airs right after Kadenang Ginto at approximately 4:15 p.m. and before Star Hunt. During the meet-the-press event, Imee Marcos openly said she would support a campaign to have Nora Aunor proclaimed as National Artist, same with the late Comedy King Dolphy. According to her, Aunor should have been proclaimed a National Artist but she understands that there is a process a candidate has to go through. She said she is biased when it comes to Nora because she was the star of Himala that she produced when she was head of the Experimental Cinema of the Philippines (ECP) that gave rise to a new wave of Philippine films paving the way for bolder and maverick filmmaking in the llater years of the Marcos regime. “Buwisit. Nabubuwisit ako na wala pa si Ate Guy. Nabubuwisit lalo ako na hindi pa rin si Dolphy. It’s long overdue, nakakapikon na. I meant to say, ano ba ang dahilan? What’s the problem? I don’t get it. I think they are really overdue and it’s about time,” she ended. Imee has loved the film industry since the time she was given the baton to wave and produce films as director general of the ECP in 1982, films like Peque Gallaga’s “Oro Plata Mata,” Ishmael Bernal’s Himala, Pio De Castro 3rd’s Soltero, Uro de la Cruz’s Misteryo Sa Tuwa, and Celso Ad Castillo’s Isla. With her passion for Filipino movies, it is no wonder she would still produce film until recently. In 2010, Marcos brought Donor to the big screen, starring Meryl Soriano and Baron Geisler; then Pinta Kasi, starring JM de Guzman and Erich Gonzales, which won Best Picture in the independent category of the 2011 Metro Manila Film Festival. And she authored the bill that created the Film Development Council of the Philippines (FDCP). “I actually started my political career when I became the national chairman of Kabataang Barangay (now Sangguniang Kabataan). That time, the way to communicate with the youth was through TV or movies—not by speeches, meetings or fora because no one will give you attention,” Marcos explained to the entertainment press. “So I entered Kulit Bulilit and Kaluskos Musmos. That’s where Herbert Bautista and Maricel Soriano started. Joey de Leon also wrote scripts there. That’s why through those shows, I was able to get closer to the young people, and I became more interested to showbiz that time too,” she shared. According to Marcos, it was during their era when the Philippines was the second largest filmmaker in the world next to India, producing 140 movies in a year. She hopes Filipinos can do this again this time. “If we play this right, I really believe that this could be another golden age [of Philippine cinema]. We can really embark on another Golden Age of Filipino Films because there’s so much talent today, it’s so easy to produce, and I’ve always maintained that Filipinos have stories to tell the world,” Marcos said. Marcos then reminded that it was during their era when the government established the Optical Media Board (OMB) and the Movie and Television Review and Classification Board (MTRCB). She pointed out that now is the best time to make the needed change especially that they are still using the laws they have made. “We see that our laws for the creative industry are very old. Until now, MTRCB is regulating the Presidential Decree 1985. I was the one who started the amendments of OMB. And we are the ones who made the laws of the Film Development Council of the Philippines (FDCP) in 2002 when I was a congresswoman. All of those laws are still the same. They need to be changed considering the development of our industry,” she explained. “If I will be able to have a national post, what I have to do is to help the Philippine cinema. My father believed in the power of films, while my mother always say that Filipinos are natural-born artists,” she mentioned, also hinting of a senatorial run in the 2019 elections. “In the ‘70s and ‘80s, the only problem was the production; there were lots of issues also because we had lesser equipment. But now, the issue is the distribution. There are a lot of films these days—from indie, to mainstream, to regional—but it’s not being shown to the public because our distribution network is just for the studio films,” she continued. More stories of these kinds at www.isah.red. Follow me on Facebook (@isahvr), Twitter (@isahvred and Instagran (@isahvred.